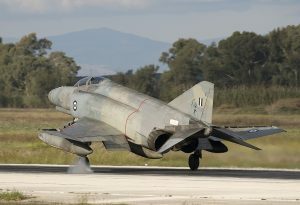 An official ceremony was held at Andravida air base on October 31 for the disbandment of 339 ‘Aias’ Mira, one of the two locally based F-4E (AUP) Phantom II squadrons belonging to the Hellenic Air Force’s 117 Combat Wing. The chief of the Hellenic Armed Forces, Admiral Evangelos Apostolakis and the Chief of the Hellenic Air Force General Staff, Lt Gen Christos Christodoulou, opened the ceremony with welcoming speeches. Among those present at the ceremony were the Chief of the Hellenic Tactical Air Force, Lt Gen Georgios Blioumis, high-ranking HAF officials, retired commanders of the squadron, representatives of local political and religious communities as well as current air force staff who served with 339 Mira. The ceremony highlighted the squadron’s history and accomplishments and its contribution to the defence of Greek interests, as well as the squadron members that lost their lives during active service with the unit. Finally, 339 Mira’s retired commanders placed the unit flag into the squadron’s museum. Two F-4E (AUP) jets were displayed for the occasion: serial 01504 was fully armed with air-to-air missiles. Serial 71744 was partly painted to mark the disbandment, with different artworks on each side of the tail highlighting 65 years of operations by ‘Aias’. Though 71744 is due for overhaul, it is expected to return to operational service with 338 Mira, and will likely retain these 339 Mira markings. Three F-4E (AUP) aircraft from 339 Mira flew during the ceremony, performing some flybys.